Pizza was invented in the city of Naples, Italy. Today it has become popular all around the world and many people enjoy it as a snack or a substitute for a full meal. The pizza itself usually consists of a flat bread base, which is most often topped with tomato sauce, cheese and toppings such as vegetables and meats. There are many different variations of pizza and many people like to add their own special ingredients to the dish. Pizza can actually be a highly nutritious dish if made with healthy ingredients and if healthy portion sizes are consumed. There are many healthy options you can include in your pizza dish and substitutes you can use instead of fattening toppings such as using feta cheese instead of mozzarella cheese. Pizza also contains all of the four main food groups – grains, dairy, proteins and vegetables. If made with high calorie and fattening ingredients, one slice of pizza can have a very high caloric count. To stay healthy but still enjoy the taste of pizza, there have been many variations of healthy pizza recipes created. Some of the variations are completely different from the original recipe of pizza and others substitute some of the main ingredients and use low calorie ingredients instead. These lovely little pizzas can be used as an after school snack or as a surprise in the lunch box. They are a great option for those nights when you need something easy to whip up. The best part about these mini pizzas is that they are low in calories and can be frozen for a rainy day. On a baking sheet or pizza pan, place the sliced English muffins. On each muffin half, spread 1 tablespoon of sauce. Top it with 2 tablespoons of cheese, and 1 tablespoon of ham, mushroom and pineapple. Garnish each piece with 1-2 teaspoons of chopped onion. 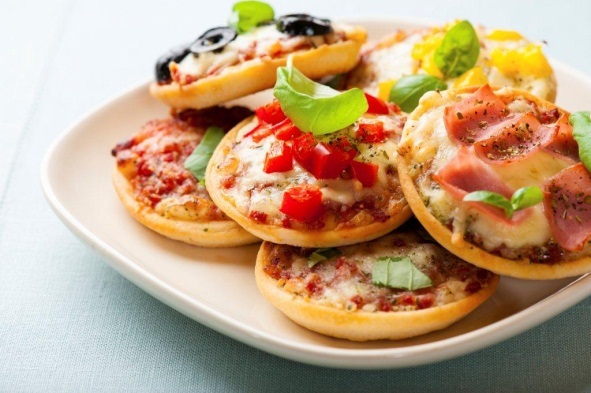 Bake the mini pizzas for 10-12 minutes, or until the cheese is melted and the edges of the English muffins are crisp. This is a nice twist on the typical pizza. By using a flatbread base and boneless chicken breast, this variation of pizza becomes a healthier option. Great for a midsummer night meal or even for your child’s lunchbox, these flatbreads are sure to please everyone! Place the onions and peppers on thick foil and sprinkle with pepper and place on the grill. Brush the chicken breasts with cooking oil. Cook the chicken three or four minutes per side until lightly browned. Remove the chicken and veggies from the grill, then lower the heat to 400°F. Cut the chicken breasts into small bite size pieces. Blend the vegetables, barbecue sauce and pineapple juice to make a chunky sauce. 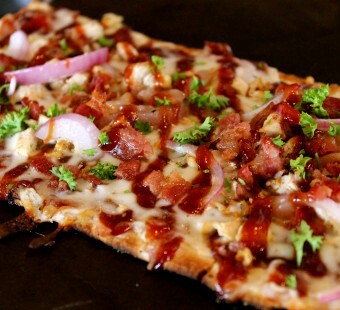 Place the flatbreads on an oiled baking sheet or grill tray. Spread 1/2 cup sauce on each flatbread and top with the chicken, cheese, pineapple, and Canadian bacon and place on the grill. Cook for about 10 minutes, until the cheese has melted.